By Crystal S. Anderson, PhD and Kaetrena Davis Kendrick, M.S.L.S. RIVENDELL (AHMN) — E.L.F.s have started to gather for Super Junior’s Super Show 4, to be held in the biggest tree in the elven city. Armed with their sapphire blue lightsticks, legions of fans look forward to cheering on the group at the history-making show. Super Junior is the first Kpop group to play the Rivendell Celebrian Arena, and rumor has it that SM Entertainment is currently contemplating additional dates in Mordor and Minas Tirith, with the possibility of holding a fanmeet on the Pelennor Fields. But don’t log on to Ticketmaster just yet. Aren’t you a little skeptical? You should be, because news reporting in the Kpop world sometimes looks just as improbable. In our investigation of all things Hallyu, KPK has noticed several trends in the way information about Kpop is distributed. This article is about how Kpop fans are informed, or in some cases, misinformed, by coverage of Kpop. This is not about any one outlet or blogger, and the examples and photos within this article are used to illustrate a trend. They should not be construed as judgements on how individual sites choose to create or distribute kpop news. We all know that information is a necessary commodity for the Kpop fan, especially for the Kpop fan who cannot read Korean and does not have access to Korean news outlets. However, not all sources of information are created equal. Some are collections of bloggers who write for fun, while others are businesses who have a bottom line. However, when outlets claim they are members of the press, they actually are putting themselves in a situation that is governed by ethics and rules. If you are going to invoke your freedom of the press privileges, that means that you are playing by the rules by which real members of press play, even on the Internet. The Society of Professional Journalists, established in 1909, produced a Code of Ethics embraced by journalists across media as a guide for ethical behavior. Journalists should “be honest, fair and courageous in gathering, reporting and interpreting information,” “be free of obligation to any interest other than the public’s right to know,” and remain “accountable to their readers, listeners, viewers and each other.” That’s what journalists do. As a result, they enjoy protections under the First Amendment. For instance, if you report something that someone does not like, but it is fundamentally true, you can invoke the First Amendment and its protections from accusations of libel. But most people writing about Kpop and the outlets they represent do not consider themselves to be journalists. They see themselves as Kpop enthusiasts sharing their opinions and observations with the world. That’s cool, but the Internet is not the Wild West where anything goes. Once you say that you are providing information to others or are operating as a representative of the press, you have obligations, especially if you want people to respect you and take you seriously. Bloggers who do so are often operating according so some kind of ethics, like the ones proposed by Martin Kuhn in his article in the Journal of Mass Media Ethics. His proposed code includes values that bloggers should embrace, such as interactivity (“respect blog etiquette), free expression (“do not restrict access to your blog by specific individuals or groups,” “allow and encourage comments on your blog”), truth (“never intentionally deceive others”) and transparency (“reveal your personal affiliations and conflicts of interest,” “cite and link to all sources referenced in each post”). Fig. 1. 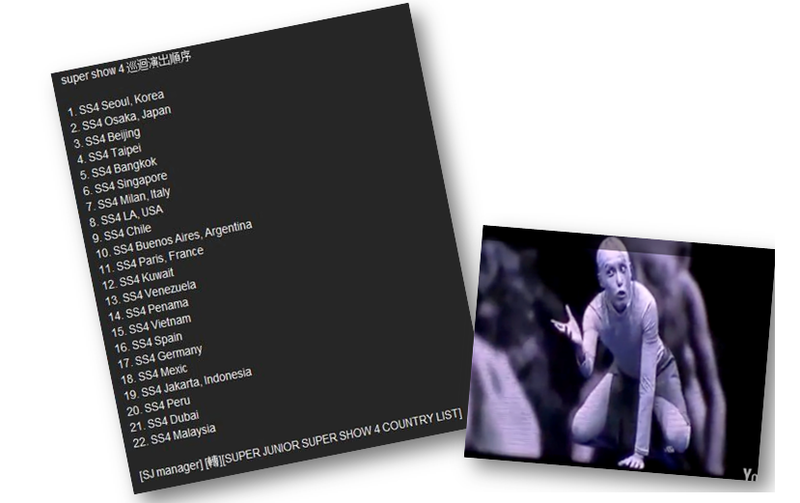 American Kpop Fans reports Super Junior Super Show 4 Tour dates as confirmed. Fig. 2. 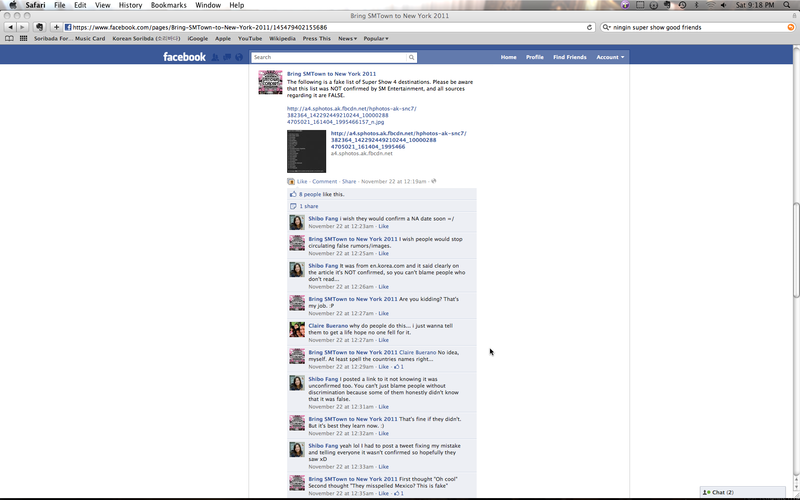 Bring SMTOWN to New York 2011 refutes Super Junior Super Show 4 dates as false. With that in mind, you should know that all Kpop outlets do not always engage in these practices. For example, instead of dealing in truth and transparency, some deal in rumor (a story that circulates without confirmation). One recent case involved a false story about tour dates for Super Junior’s Super Show 4. Korea.com published a list of future stops, which included such unlikely destinations as Milan, Kuwait, and Panama. This information was not confirmed by SM Entertainment, and the only source was an unattributed fanpage with no link. However, Korea.com’s faux pas was compounded by other outlets posting the story without questioning its veracity. 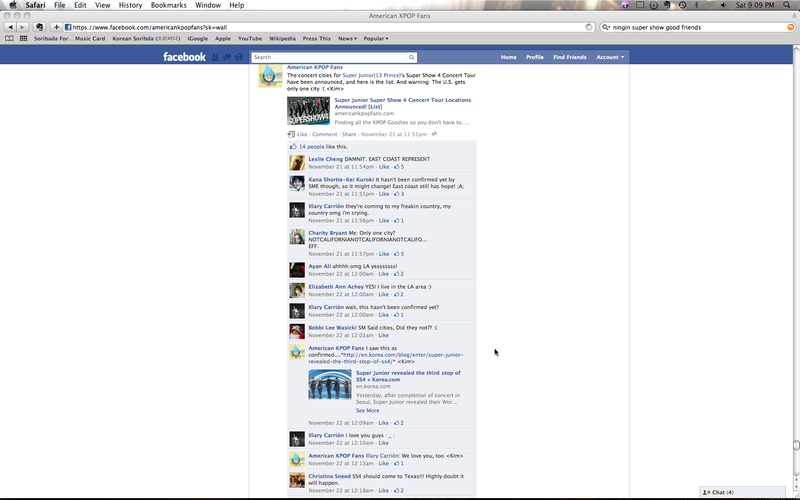 American Kpop Fans posted the list with the citation to Korea.com on their site and the link on their Facebook page. When questioned about the confirmation, Kim cites the original Korea.com story, and says, “I saw this as confirmed” and says AKPF will update the list if there are changes. (Fig.1). As of this post, both the site and the Facebook page have not retracted the post nor disavowed the list. However, Bring SM Town to New York 2011 posted that the list was a fake, noting that the information was not confirmed by SM Entertainment. (Fig 2). It added, “I wish people would stop circulating false rumours/images.” Meanwhile, various E.L.F.s were alternatively excited because they thought Super Junior would be coming to them, or sad that their location was not on the list. As a result of both Korea.com and AKPF’s actions, fans received erroneous information. It may also cause fans to wonder about the veracity of other information, which hurts the credibility of both outlets. A serious problem arises when individuals withhold or skew information. Doing so has a negative impact on the reader and the credibility of the writers themselves. One way this happens is with gatekeeping, which is the process by which information is filtered, or has parts removed for any purpose, prior to being shared. Gatekeeping is not new in news at all – in fact, you’ve experienced gatekeeping all of your life, in matters where news is not a major player at all. Why do you like Campbell’s chicken soup? Is there a reason you prefer Mahatma rice over Uncle Ben’s? Perhaps you prefer to get your vegetables from your own garden or the local farmer’s market, rather than frozen ones from the supermarket. Food comes from many channels, and your preferences are mostly due to the primary caretaker who introduced those items to you. In 1947, social psychologist Kurt Lewin recognized the power of the universally recognized primary caretaker of his time – the housewife – as someone who had great power over her family’s eating habits. She would not only choose which products to bring home, but regulate where those items came from and the consumption of those items within the household – all the way down to how the food was prepared and served. Even though Lewin’s work was primarily done as part of a food marketing study, he did recognize that his theory could be applied to media channels: “[gate theory] holds not only for food channels but also for the traveling of a news item through certain communication channels in a group” (145). (2) the gatekeeper that acts as ‘innovator, change agent, communication channel, link,intermediary, helper, adapter, opinion leader, broker, and facilitator’ (2010, 264). Fig. 3. Bring SMTOWN to New York 2011 acting as gatekeeper. KPK has observed that more often than not, Kpop information sources have acted under group 1. Moreover, more recent observations note that some sources operate under the guise of group 2 while enacting behaviors of group 1. Let’s first consider the group 1 gatekeepers, whom we call G1Gs (this includes those who pretend to be group 2s). Those are the outlets that state they exist to give you the latest in kpop information and fan news but then when asked for specific information, they whimsically or hostilely respond that they don’t want to reveal that information without stating why (e.g., “due to security concerns”). Or perhaps you’ve been told in a forum that you’ll be banned if you ask what time B2ST’s plane is scheduled to arrive in LAX. At the very least, this kind of gatekeeping is suspicious and at the most it is unethical, not only because there is no good reason to withhold the information or create punishments for asking questions, but also because a) the information is not privileged or private and b) it compromises the transparency in freedom of information to which all true journalists aspire to. How can your blog followers trust you if you’re announcing that you’re holding information from them? In other words, an information source that treats knowledge of where SNSD stayed during their recent NYC trip like CIA-classified information while fans are standing outside the joint and uploading fancams is suspicious. Most egregious are sources that go against their own information distribution policies, stating what they won’t do and actually doing the opposite, whilst denying readers access. In short, unethical gatekeeping undermines democracy in the most precious of resources we have left: the free press. To be sure, there are times when withholding information is necessary. Perhaps a writer is working on an exclusive interview with Rain during his military service (by the way, that wouldn’t happen); or maybe a link slapper-upper is waiting on a signed shirt from Kim Hyun Joong to arrive in the mail. However even in those instances, transparency is the foundation of maintaining the trust of readers. That’s what teaser headlines/updates/tweets are for. Let people know why you are withholding news for a limited time, be it for serious or fun reasons. And that’s how you get to be a group 2 gatekeeper. We call this group G2G. G2Gs are clear about their mission, and their mission is reflected consistently in their actions. When it comes to Kpop, they understand what information in Kpop is actually private (which room 2PM is staying at their hotel in Malaysia) and what is not (which hotel 2PM is staying in). G2Gs make it very clear what information will be provided from them, and as a matter of due diligence and collegiality (read: they willingly respond to questions and requests without intimidation, hostility, condescension or kow-towing), they promote alternative channels for you to locate the best information that they have decided they will not cover. G2Gs understand the fan-based information network of Hallyu and work within its flexible and generous system. G2Gs would never imply, for instance, that Kpop idols don’t want to be bombarded with fans when they arrive at the airport – especially when you can find evidence to the contrary. G2Gs recognize and embrace the different levels of fan engagement with Hallyu (new Kpop fans are a constant, and old Kpop fans are hawks!). Additionally, G2Gs work hard to expand Kpop information networks and positively affect the flow of Hallyu information creation and dissemination channels. So if you are a Kpop reader, what can you do? We know you need your fix of news and information about Kpop, so here are some ways you can be sure that you are getting the best information. 1. Consult multiple sources of information, and if something doesn’t sound quite right, check the source article. If you find something wrong with the source, alert the secondary source (the place where you came across the information). 2. Form a relationship with your favorite sites, and interact with them. Writers feel far more responsible to those that they know are frequently engaged with their work. 3. When reading Kpop news, consider why the site is telling you the information. Even better, think about what they aren’t saying. If a Kpop site is waxing poetic about the consistent perfection of G-Dragon, but never discussing the ramifications of accountability about smoking pot in Japan, and furthermore doesn’t send you to places that are willing to talk about it, that’s a red flag. 4. Be sure that you know who is ultimately responsible for what you’re reading. You need to be aware that ad banners are there for a reason, and it may affect what news you’re getting. 5. Beware of Kpop site-fueled “controversies” and “scandals.”Both words are misused often in entertainment news, and both are used as tools to create confusion and gain web-site hits – not actually give bonified or worthwhile information. Stay above the fray! 6. Most importantly, ask questions! Don’t be scared! Once a site has decided they want to provide information, they have a responsibility to those who consume the information. If anyone representing a site uses intimidation, censoring, or tries to make you feel badly because you don’t know something, call them on it and make your choice to continue using that source based on their response to you. In conclusion, we are not targeting any particular outlet. Just like you, we rely on multiple outlets to remain knowledgeable about Hallyu. We also know that it harms both readers and writers alike when the information does not flow freely and correctly, and being aware of things like bias and ethics are key to keeping those channels open. Don’t forget to share your experiences and opinions with us! Garcia, Cathy Rose A. “Web Site Brings Breaking K-Pop News.” Korea Herald. Web. 26 November 2011. Kuhn, Martin. “Interactivity and Prioritizing the Human: A Code of Blogging Ethics.” Journal of Mass Media Ethics 22.1 (2007): 18-36. Laidlaw, Emily B. “A Framework for Identifying Internet Information Gatekeepers.” International Review of Law, Computers & Technology 24.3 (2010): 263 -276. Lewin, K. “Frontiers in Group Dynamics: II. Channels of Group Life; Social Planning and Action Research.” Human Relations 1 (1947): 143-153. “SPJ Code of Ethics.” Society of Professional Journalists. Society of Professional Journalists, n.d. Web. 26 November 2011. <http://www.spj.org/ethicscode.asp>. Yes, credibility and ethics in blogging, especially since anonymity on the web sometimes feels like “anything goes,” can make this cultural site go far with a wide audience–thanks for the references by Martin Kuhn and Emily Laidlaw! Hi Sandra, thank you! Accountability is sometimes lacking in kpop sources. More often than not, it’s unintentional. With the rising popularity in kpop though, these breaches, which so far are are going relatively unnoticed, will have to be addressed – especially since Hallyu lives on the Internet.